Are you okay with being mediocre as a leader? 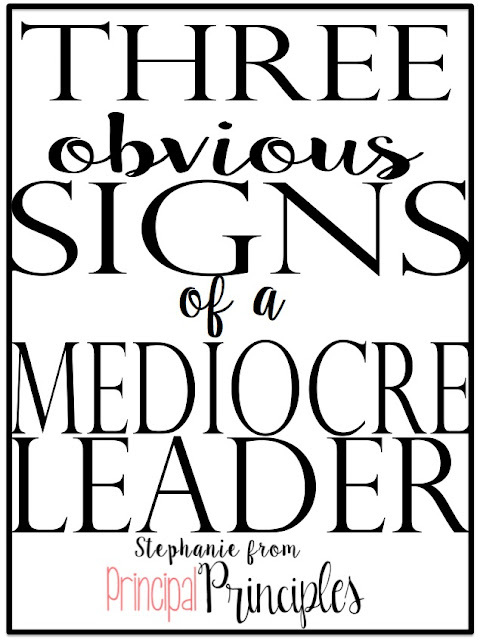 Would you like a doctor to perform a surgery on you if he/she was considered mediocre? No way, right? Then why is it okay that our schools would be lead by a mediocre leader? Excellence is not an act, but a habit. The entire school practices being excellent. We wouldn't ask our teachers to practice being mediocre. Mediocrity is not the new excellence. Mediocrity is simply a choice we make every day. The saying, "it's good enough" is simply just not good enough. If it can be done better, why not make it better? Why settle? Change your mindset about what is acceptable. 1. Lack Performance-We will fail from time-to-time. The cards might be stacked against you in some way at some time. No one is perfect. We will fall short in our efforts. Trust me...I have plenty of times. Lack of performance could also be the result of not putting enough energy, time and commitment to the task at hand. We need to be vigilant in our efforts- get our hands dirty, roll up our sleeves and break a sweat from time-to-time. If you fail, get back up on your feet and brush yourself off. Dig deeper. Rise strong. Re-evaluate why your performance may be a bit lacking. It could be due to several reasons- resources, obstacles, your skill set, your expectations, lack of motivation, burnout, etc. It's important to diagnose the root cause of a lack of performance. Knowing the cause will help you figure out how to address it and then move forward to success. 2. Not invested/Checked-out- A school can be successful only if the leader's heart and soul are immersed in the school's success. Leading is more than a degree. The leader has to be engaged and invested personally and deeply in the school. Your attitude and presence is infectious. You are a community figure. Everyone is watching. Make your presence come alive. Don't just show up to work everyday. School leaders need to be invested and tuned in to the needs of the teachers and provide guidance and direction. 3. Lack Vision- If you haven't established a vision for reaching the campus goals, there is no way to lead effectively. Effective leaders know how and where they are leading the campus. Great leaders possess the ability to inspire action. It may be with their ideas, an inspiring speech or a new approach, but successful leaders can make people take action for change. Rosalynn Carter said, "A leader take people where they want to go. A great leader takes people where they don't want to go but ought to be." What is your vision this year? Have you set that vision with your staff?